On Sunday, when I posted my weekly workouts recap, a few of you asked why I was doubting my ability to run a 57-minute 10k. Your confidence in me is touching. I can't help but wonder if it's misplaced! Here's the thing: Two weekends ago, I held an ~8:30 pace to achieve my new 5k PR. That's amazing to me. I can't believe I did it; I honestly cannot even fathom holding that pace for 4 miles, let alone 6.2. The 10k is a whole different animal than the 5k. I think maybe I can hold 9:30 for a 10k, or even 9:30 for five miles and then a faster finish. That would give me a sub-60 race. Like I mentioned a few weeks ago, I'm not sure what my 10k PR really is, and I know I'd be happy with a sub-60 race. These are public now, so I have to be accountable! I want to really give this race my all. In a way, the last year of training has been for this race, so I owe it to myself to really go for it. And of course, I have other goals. I also want to run a smart race, to avoid walking, and to start at a decent pace and maintain it without burning myself out. She keeps saying, "I don't get why an 'official' 10k will feel different than just running the distance..." Hopefully she'll see! I know my legs can do it; I know they can outrun discomfort. If I can breathe through it, I think my goal is within reach. I need to trust my training, turn off my brain, and let my body do what I've been consistently training it to do. Any 10k tips or tricks? I have a 10k this weekend too. I'm not sure what my goal is. My PR is 57:03 but on this course, I've never come close. I'm thinking about 1 hour. But we'll see. Good luck to you. I bet you crush it. Good luck! I think your goals are totally doable. I would say to run at your tempo-run pace for the first 5K and only then focus on picking it up. It's amazing what we can do in race circumstances and you have the distance running to know you'll be able to last through it. I do believe in you! Push yourself, make it your mantra :) I always repeat to myself it is...my day to do it, my pace, and it's so much more fun to be fast in race than a training run! lol You did speed work in some cruel temps - you have more endurance for it :) Go get it! Sub 60 anything will be great. I hope you have a wonderful run. I think where a lot of people get into trouble is that they are tempted to treat the 10K and 5K the same way because they are both "short distances". But one is twice as long as the other! It's easier to surprise yourself in a 5K because you start out at a lightening fast pace and there's a pretty good chance you can hold on for a couple more miles, but that strategy can't work in longer distances, even the 10K. You're forced to be more strategic - 6 miles is a long time to run fast. 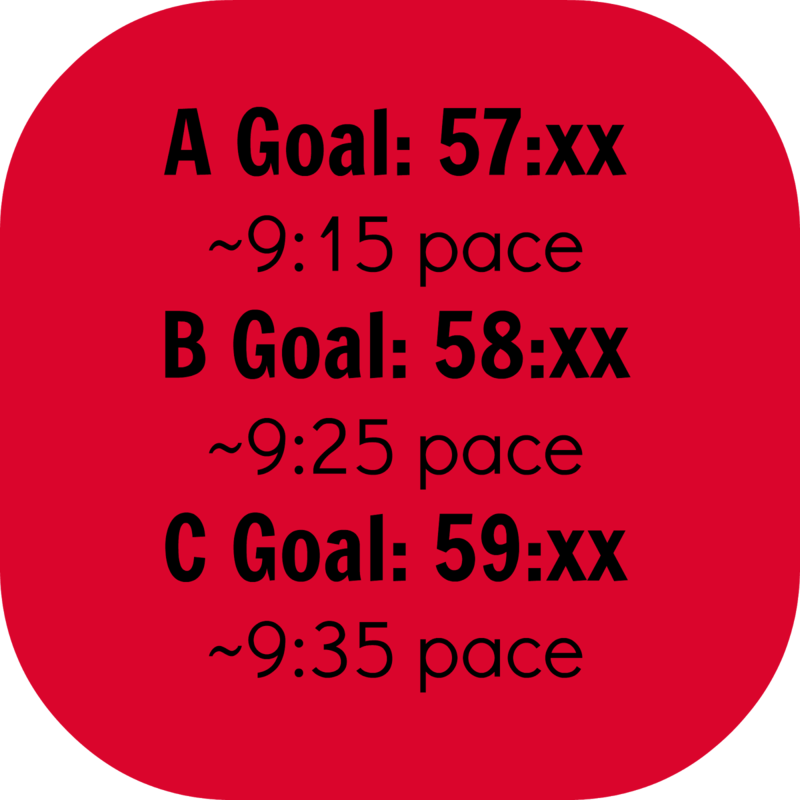 I think a good strategy is to try to run the first 1-2 miles by effort instead of pace. Don't look at your watch, just focus on your breathing and tune into your body's signals. I once heard a saying that "if you don't feel like you're going too slow at the start, then you're going too fast." Slowly work your way into a comfortable tempo pace that you feel like you can hold onto, and stay steady, saving something in the tank for a fast finish. Racing is all about mastering the art of holding back. By the way, your 5K time indicates that you are capable of a sub-55 10K. While that may seem scary, I do think that you are still selling yourself short with some of your race goals, and I wouldn't be shocked to see you pull off yet another surprise fast race on Sunday. :-) Good luck!!!! Ali, you got this ! Run this at the speed that feels good to you! We will still come back and read no matter the results, you are going out there and giving it your all, that's what is most important. Tips, positive thoughts only! Tell yourself, "I can do this, I got this, I'm doing it!" Push any negative thoughts out! Have an awesome race ! Aww, I see my comment up there! I hope that inspires you knowing that we all believe in you! You got this! But hey, even if you don't meet your goals, it's not the end of the world. You're still awesome! Good luck! I know you can do it! 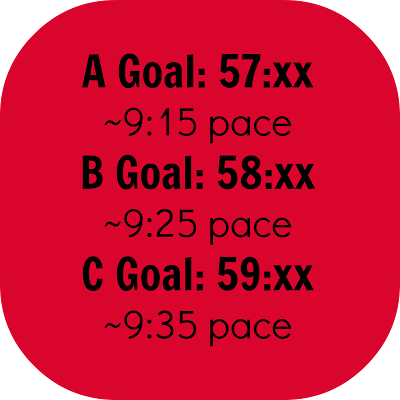 I think a good strategy in 10ks is to do the first two miles slightly slower than goal pace, the middle two miles at goal pace and the last two slightly faster. Thats what I did in my 10k in March and it got me a PR! Have a great run Ali!!!!! Believe you can and you will!!! You and Elizabeth are winners, just like the Indians!!! good luck! you've got this! 10ks are one of my hardest distances to race - because i want to go out like a 5k and then struggle train home. Running a smart race with the conditions you are given on race day is really the best goal to have! Plus the day will be a success no matter what since it's Elizabeth's first race and you were a big part of her journey. That's worthy of being celebrated all on its own! 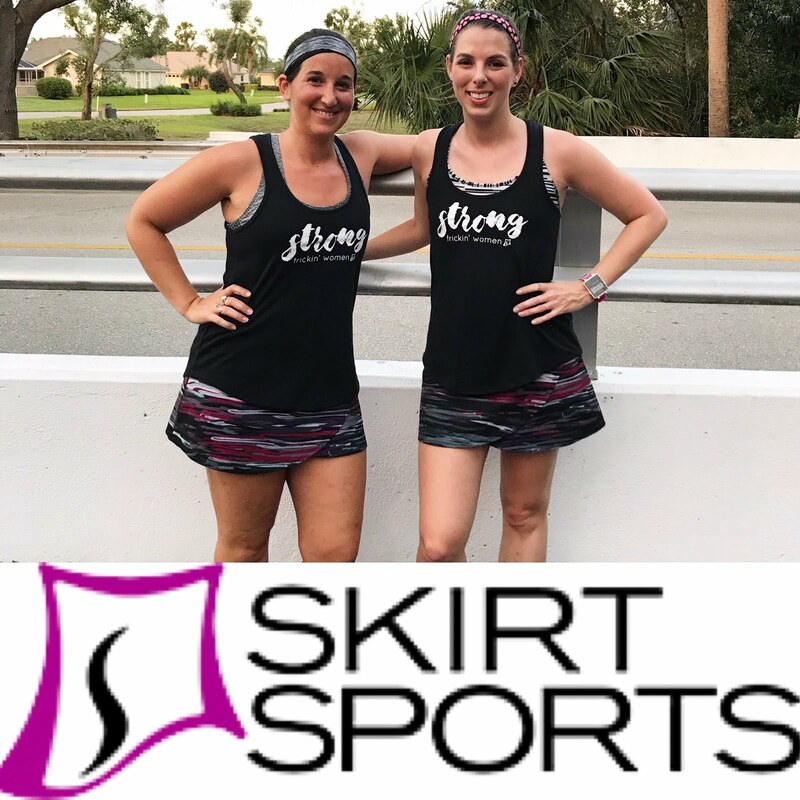 I get nervous sharing goals on my blog too, but after falling way short with a DNF in Chicago last year I realized ... no one will understand your running highs and lows like fellow runners! Plus I learned then that one race doesn't define your progress or where you are at as a runner. It's literally just one race. Thinking of it like that takes some pressure off! Can't wait to read all about the day, and how you and Elizabeth celebrated!